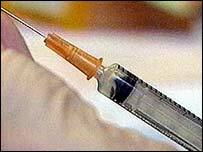 A Swiss euthanasia group may have helped more British people to die over the last two years than was previously thought. Lesley Close, sister of terminally ill John Close who paid the Dignitas group in Zurich to help him die, says 22 Britons have sought its assistance. Dignitas was previously thought to have helped only five Britons bypass the UK ban on euthanasia. A Bill proposing the ban be lifted will be presented to MPs next week. Under a Swiss law dating back to 1937, assisted suicide is a crime only if those providing assistance can be shown to have acted out of self-interest. Dignitas, founded in 1998, was first noticed in the UK when Reg Crew sought its help to die in January 2003. In the last two years it has helped 22 Britons die, according to Ms Close. She said: "I do not think any of these 22 people should have to go to Zurich just to die. "We should have our own provision here." She said more than 550 Britons were now members of Dignitas and that, according to its founder Mr Ludwig Minellis, 20% of its members take up the offer of assisted dying. "So that's over 100 people who are likely to take the journey to Zurich. I do not think we should be allowing that," she said. A survey of 790 people commissioned by the Voluntary Euthanasia Society found 50% would consider going abroad to receive medical assistance to die if they were suffering unbearably from a terminal illness. Ms Close said the UK should change its policy. "One of the arguments people often use against a lift of the ban is the slippery slope argument. "But if you look at the evidence that comes out from The Netherlands where it is legal, it does not support this," she said. Lord Joffe will present the Assisted Dying for the Terminally Ill Bill to a House of Lords select committee next week. It proposes to "enable a competent adult who is suffering unbearably as a result of a terminal illness to receive medical assistance to die at his own considered and persistent request." Mark Slattery from the Voluntary Euthanasia Society said: "People seek alternatives because the law in this country does not give them any. "The Bill next week aims to give people a properly safeguarded route to medical assistance to do these things properly rather than them happening in a completely uncontrolled way." Julia Millington from the ProLife Party said: "The Voluntary Euthanasia Society would have us believe that the law would only apply in certain cases where laid down criteria are satisfied. "However, evidence from countries where euthanasia has been legalised, such as Holland shows that it is not possible to prevent the boundaries from being expanded. "Voluntary euthanasia has led to involuntary euthanasia. While slippery slope is an overused term, I think it's a real danger." Dignitas has been contacted for a comment.